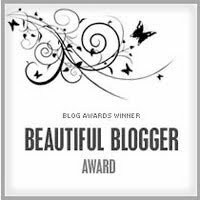 Thank you CheekyBeauty for sending me the Beautiful Blogger Award! The rules of this award is that I have to write 7 un-known things about myself, and then pass the award onto 5 other bloggers.... so here goes! Ummmm - this is hard, am having to delve into dark recesses of the brain! 1. When I was born I had a cone head....... (no, seriously!!!) It did go down within a matter of hours, but imagine my poor Mum's horror! 2. My head has since been glued together - I dropped a TV on it when I was at secondary school. It was a choice of shaving my head and having stitches, or having it glued.... errrr like there was a choice - hello!? 3. At my first week of a new, private secondary school I managed to smash a hot chicken and mushroom pie into a boys face by accident & he got burnt. He told the teachers the pie was on the floor and he was running and tripped up into it, so I wouldn't get in trouble - bless him! I found him on Facebook recently and he told me it didn't scar, phew! 4. At the same school I was responsible for making my form teacher crash into my headmistress' car. 5. I have a credit in Blazin' Squads album - I was 'the beanied up receptionist' dontcha know! 6. When I was 12 I had a french crop. No you're not seeing a photo of that one! I wanted East 17 shaved into the back but my mum wouldn't let me, meanie! 7. When I was younger and blonder everyone used to tell me I looked like Cat Deely. I now get Michelle from Big Brother - cheers. I thought that was going to be hard but it was alright actually! Thanks for tagging me hun! Blazin Squad?? No way...now theres a claim to fame and a half! :) What ever happen to them?